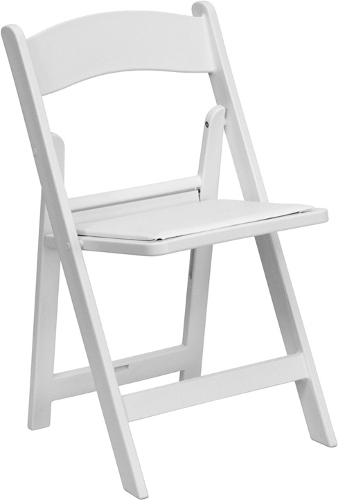 This white outdoor plastic resin chair is perfect for weddings, and other special events. This is the most common chair rental companies use for outdoor weddings. The old style of this chair consisted of a wood frame, and painted outside. This chair is constructed from commercial resin. The load rests on the cross beams, and not the holding screws. The 1/2" thick padded vinyl seat is removable, making it easy to clean. Folds to a slim 2.75"